Pregnancy, birth and motherhood are times in our lives where we experience the interconnectedness of everything. Our journeys are not random events, they are as if a read out of our mindsets, beliefs and fears and the result of our lives thus far. Jane will also be offering a Post~Conference, 1 day workshop called 'Re-working the motherline' with Jane Meredith. Jane Hardwicke Collings is a midwife, teacher, writer and menstrual educator. She gives workshops in Australia and internationally on mother and daughter preparation for menstruation, the spiritual practice of menstruation, and the sacred and shamanic dimensions of pregnancy and birth and menopause. 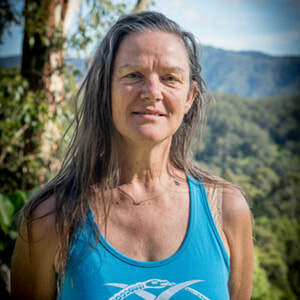 Jane founded and runs The School of Shamanic Womancraft (formerly The School of Shamanic Midwifery), which prepares women to practice and teach the Women’s Mysteries and midwife the soul. Jane is the author of Ten Moons, the Inner Journey of Pregnancy, Thirteen Moons, How to chart your menstrual cycle, Spinning Wheels (a guide to the cycles), and Becoming a Woman (for girls approaching menstruation).